Senior Constable Anne-Marie Bennett has always loved dogs, and her interest in training them has led her to a decade-long career in dog handling. Anne-Marie’s career in policing began in Western Australia in 2000, with her foray into dog handling starting in 2007 when she spent five months training with the Australian Federal Police as a bomb dog handler. She returned to WA as a qualified dog handler until she relocated to Tasmania in 2010 to join Tasmania Police. 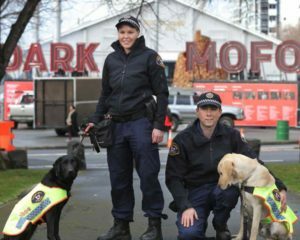 “I have always been interested in working with dogs, so as soon as a dog handling opportunity came up in Tasmania Police back in 2013, I took it,” she said. “I have had two dogs during my career in Tasmania. I worked with Police Dog Flicka for two and a half years before she retired in 2015 and came to live with me as the family pet, and I have had Police Dog Aggie since then. “I truly love dog handling and will stay in the role at least until Aggie has retired. We search houses, airports, mail centres, cruise ships, festivals – anywhere there is a need for drug detection. This makes the role diverse and interesting. “Being a dog handler requires a decent fitness level and a whole lot of patience. It can be physically demanding when we are busy. You need to remain enthusiastic the whole time, so your dog doesn’t see that you are tired. Anne-Marie is not the first female police dog handler in Tasmania – two women forged that path before her, and the dog squad is currently supported by Constable Tracey Kirkby as a relief handler. Above: Senior Constable Anne-Marie Bennett with Police Dog Aggie and Senior Constable Jareth Anderson with Police Dog Yardley (retired) (courtesy of The Mercury Newspaper, Hobart). This page -- https://www.police.tas.gov.au/about-us/100-years-women-policing-tasmania-police/women-specialist-roles/dogs-womans-best-friend/ -- was last published on February 13, 2018 by the Department of Police, Fire and Emergency Management.